Gould Instruments provides calibration/certification to industrial pressure gangers with accuracy grades of +/- 1% and +/- 3% utilizing various pneumatic calibrators and precision dead weight testers (with accuracy of +/- 0.016%) our range is 0-70,000 KPa. 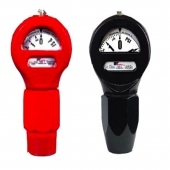 We also cater for the calibration of oxygen service pressure gauges. Australian standard AS1349:1986 is adhered to, using oil seperators. Calibration of +/- 1/4% accuracy test gauges with a range of 0/70,000 KPa is catered for utilizing precision dead weight testers, Australian standard AS1349:1986 is also adhered to. We service/calibrate and certify gauges used for backflow prevention device testing (differential) Australian standard AS1349:1986 is adhered to (+/- 3%). Gould Instruments repair/overhaul, calibrate and certify (MUD) ganger that are commonly used on driving rigs. Throughout Australia. This is a specialized sphere of our operations. Pressure ranges 0/1000 lb/in2, 0/3000 accuracy of +/- 3% is adhered to. Gould Instruments provides calibration services to vacuum gauges with accuracy of +/- 1% and +/- 3%. Testing is carried out pneumatically to Australian standard AS1349:1986. We service/repair/calibrate and overhaul pressure relief valves for a wide range of applications, utilizing state of the art reference test apparatus.